The uprising of crypto markets has drawn interest in the purchase of these digital coins, and the significant increase of Bitcoins purchases over the last year has led to the increase of his price as well. The old tale of supply and demand. Investors all over the world are looking to invest in Bitcoin in hopes that the cryptocurrency would appreciate in the future. But Bitcoin is unlike any other asset class that ever existed before, so investing in it involves using the methods and avenues listed below. 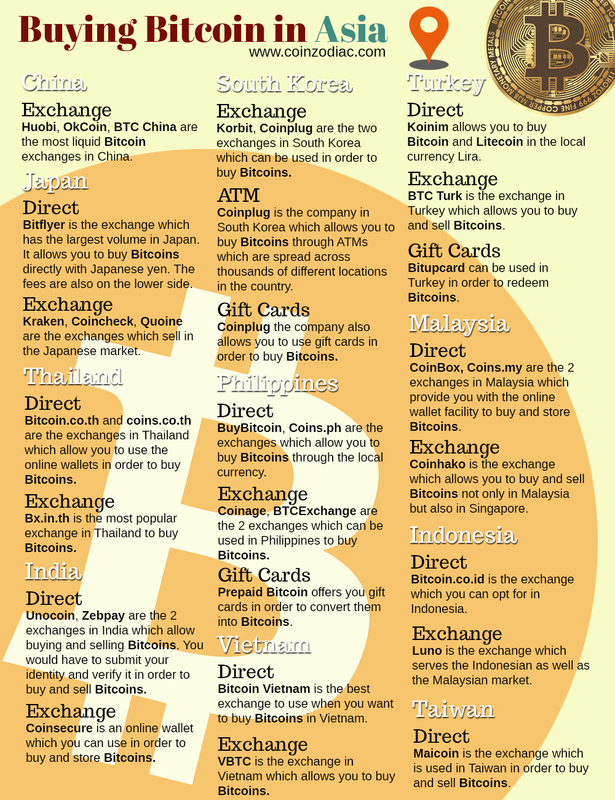 Here we will share comprehensive details on where you can buy Bitcoins anywhere in the world. To buy Bitcoins from these custodial exchanges, first you have to sign up and go through the Know-Your-Customer (KYC) verification. After a basic background check, only then you will be able to convert your fiat currency into Bitcoins. Instant Exchanges on the other hand is like your local foreign currency exchange. You need to own a wallet in order to store your Bitcoins. Changelly and Shapeshift are two of the most trusted instant exchange sites. At CoinZodiaC we recommend buying the Ledger Nano S or the Trezor to store your Bitcoins. It is always vital for you to transfer the coins you purchased on a Custodial Exchange to your Ledger Nano S wallet for safekeeping or HODLing. Buying Bitcoins is similar to a bank transaction, you just have to initiate or place the order. When the coins are officially yours, you can choose if you want to keep the Bitcoins, exchange them, or use a wallet or software to store them. The whole purpose of Bitcoin is to be able to retain full control of your money and not be codependent on third party intermediaries. Instant exchanges are a no-brainer if you ask me. Ease of Use. Instant exchanges like Changelly allows you to instantly exchange or purchase bitcoins. It is designed to be as simple as possible for newcomers. The price is also very competitive. Control. There are only two types of exchange sites, the ones that have been hacked and the ones that will be hacked. Never place too much trust on third party exchange sites, a.k.a. Custodial Exchanges to store your coins long term. Remember Mt. Gox. Security. If you’re an expert that is fine. Even network security experts like Andreas recommends using hardware wallets to store your money. Big custodial exchange sites are honeypots waiting for their inherent failure. Instant exchanges on the other hand immediately transfers them out to your own Ledger. For 99.99% of users, *any* hardware wallet is several orders of magnitude more secure and easier to use than anything else. It’s a no-brainer. Liquidity: You have to make sure that there’s an adequate number of buyers and sellers, looking at the volume of the exchange. Fees of the exchange: Fees can go anywhere from 0.3% – 7%. Binance offers a 50% discount if you use their BNB coins. Jurisdiction: Choosing a legally compliant exchange is a way of protecting your transaction. If there isn’t any based on your country, you can choose one from a different country, preferably a developed one. Here are some recommendations: Bitstamp (United Kingdom), Bitcoin.de (Germany), Kraken (Russia). Stability of the exchange: When the price of Bitcoin rises, the load on these exchanges increases significantly. Usually, that amount of traffic causes the server to override because of the extra visitors; so it’s important to look at the stability of the exchange. 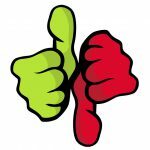 Instant support: Usually the cryptocurrency has social media channels and is important to check them to find out if they frequently update it or not. Because if they’re active on social media you will probably get instantaneous support. Anonymity = No Fiat. Shapeshift for example doesn’t require you to register and verify your identity. But you can only change from crypto to crypto meaning you still need to purchase Altcoins before you can exchange it for Bitcoins on their platform. Changelly and Coinmama allows you to purchase Bitcoins with your Credit Card (at a premium) but it requires you to first register your identity. Tech Savvy. Using instant exchanges require you to first own a wallet. You may need to understand the basics of using your Hardware wallet. Custodial exchanges may require you to know how to use their fancy trading interface. with Instant exchanges, you convert and exchange if you like the price at the moment. Trading on custodial exchanges could bring you more profit but only if you know what you’re doing. I proved that to be the case when I exchange my coins for EOS here. – Mining: this is the process where mathematical calculations are solved to mine Bitcoins from the block, and is performed only by high-end computers. – Working for them: there are some websites which are dedicated to the digital currency, with paying jobs. Some of them are: WorkForBitcoin, Coinality, Dogecoin, Litecoin and others. – Others: there are other ways to earn Bitcoins through faucets, trading, playing online games, paid to click, get paid for completing tasks and offers, lending bitcoins and earning interest, writing about Bitcoins, etcetera. coinatmradar.com – Bitcoin ATMs are one of the easiest and quickest ways to buy bitcoins. – P2P Exchange: short for “peer to peer” or “person to person”. This is the type of exchange that allows two people to make the trade of coins directly with each other. 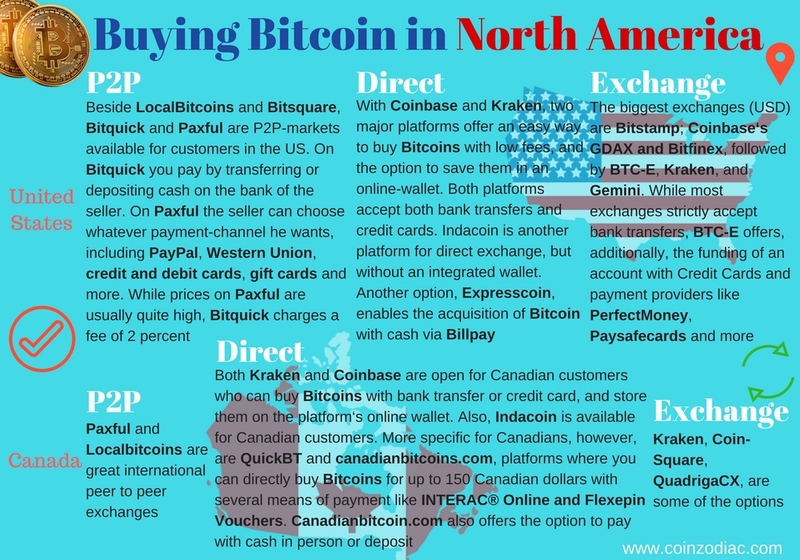 The result is an anonymous and fast transaction that allows you to purchase Bitcoins; with fiat currencies like US dollars, Canadian dollars, Australian dollars, British pound, Euros, New Zealand dollar, Chinese yuan, Brazilian real, Japanese yen, Swiss franc, among many others. There are currently 2 major platforms for this; LocalBitcoins and Paxful. 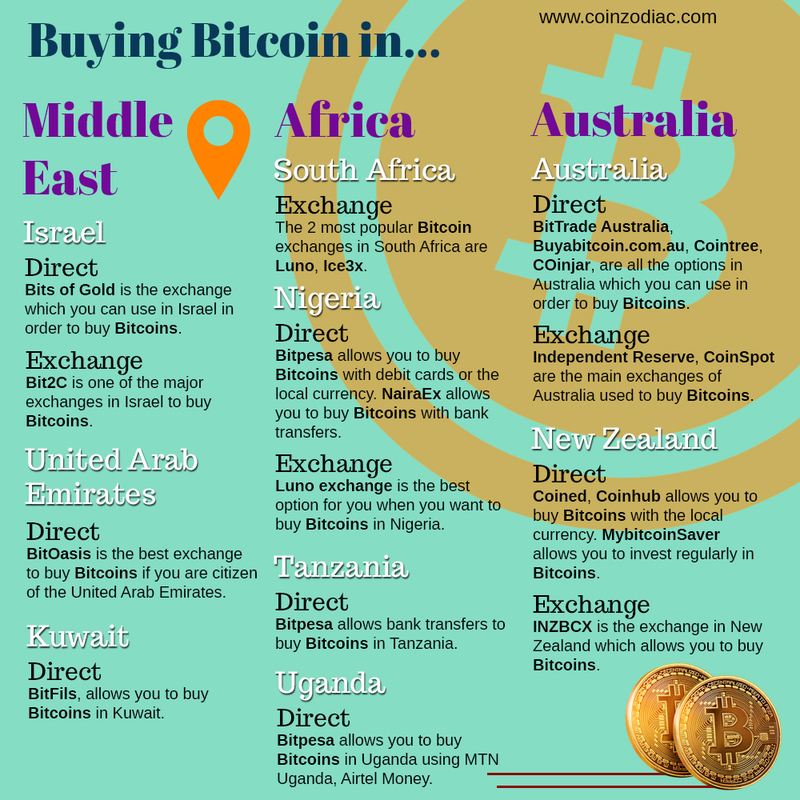 For convenience, making it easier for you to buy Bitcoin anywhere you are in the World use LocalBitcoins. It is available in 248 countries and 16087 cities. You can find your city here. P2P exchanges have high liquidity, and easy communication because of local buyers and sellers and payment methods. While it doesn’t require any identification, you could be scammed and not receive any compensation. So some may require your ID before they’re willing to transact with you, this could be considered a deciding factor for many. – Private/Complete Anonymity Exchanges: there are a wide variety of Bitcoin exchanges which provide buy-and-sell services catering to specific countries that do not require you to provide any personal details while trading. This however imposes a limit on your transactions for unverified users. This uprising market of digital cryptocurrency brings with it different platforms that can be used to acquire the Bitcoin, like Coinbase, Gemini, Kraken and Binance . Coinbase is one the largest Bitcoin exchange in the world and the number of countries which it serves is actually much larger as compared to some of the other platforms. 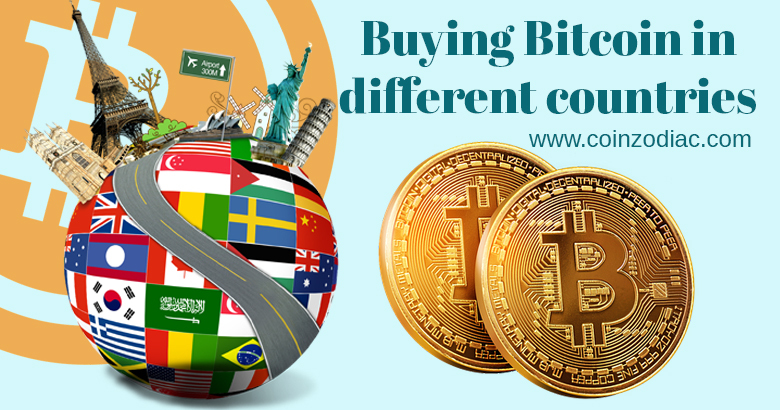 There are multiple platforms to buy Bitcoins in any country in the world. 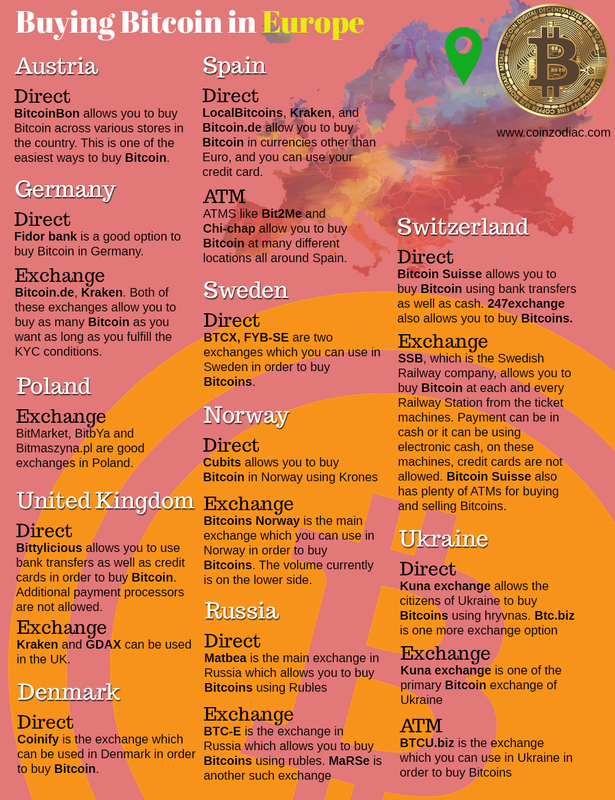 We have managed to make things easier for you by compiling all the possible ways you can buy Bitcoin by country in the image below. Just look for your country and choose your preferred method. 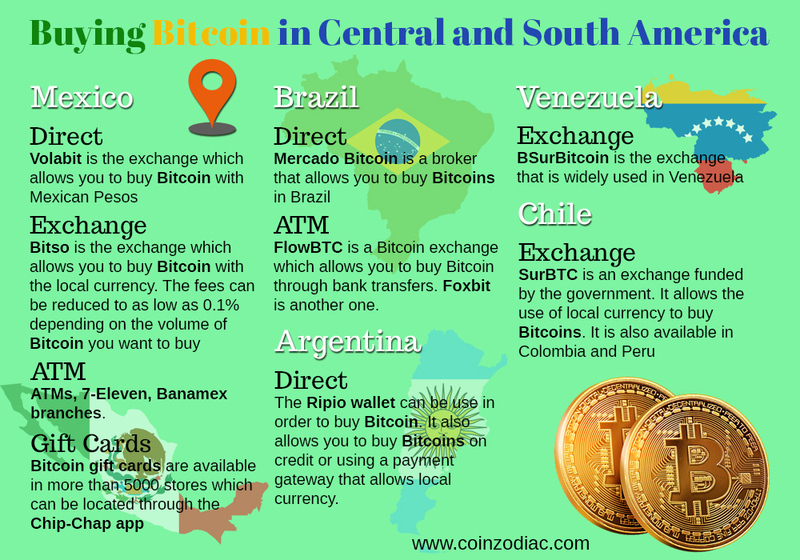 It’s important to know that Central and South America are covered by many different exchanges which can be used in order to buy Bitcoins. One such popular exchange, which covers multiple countries in Central and South America, is SatoshiTango. Some of the countries which are covered by this exchange include Brazil, Costa Rica, Chile, El Salvador, Mexico, Nicaragua, Panama, and Peru. On the other hand, Bitex offers services in countries like Chile, Uruguay, Argentina. 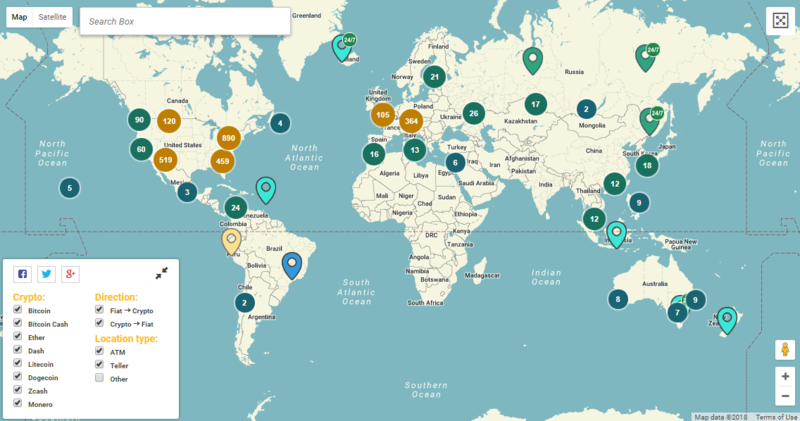 Most of the Latin American countries also have a local P2P Bitcoin exchange. In Europe, there’s Coin ATM Radar which provides you with hundreds of different locations of Bitcoin ATMs all over Europe. The direct method is large in Europe; there are plenty due to the different rules and regulations, a single exchange does not often serve the entire region. Most of these exchanges allow you to buy Bitcoin through credit card payments. Also, many exchanges in various countries in Europe like Kraken, Bitstamp, require you to complete the KYC form in order for you to be able to buy Bitcoin. These exchanges only allow you to buy Bitcoin. If you want to store them, you have to opt for a separate wallet. And if you’re looking for a full-fledged exchange, you can use Coinbase which allows you to buy and store Bitcoin. For P2P, Local Bitcoins allows most of the countries in Europe except Germany, where you can use Bitcoin.de; but in both of these exchanges, the fees are as low as 0.5% which ensures that you are able to easily buy and sell Bitcoin. In Asia, the markets and demand for Bitcoin are huge. This is one of the fastest-growing markets when it comes to Bitcoin. When it comes to Asia using ATMs, LocalBitcoins is one of the best options. ). Keep doing what you are doing – can’r wait to read more posts.